Home / International / International Topics / New / Bangladesh Ends Reservation in Govt Jobs : What about India ? Bangladesh Ends Reservation in Govt Jobs : What about India ? Prime Minister Hasina has suggested abolishing the quota system for government jobs altogether. She said in a statement in parliament, "The quota system will be abolished as the students do not want it". 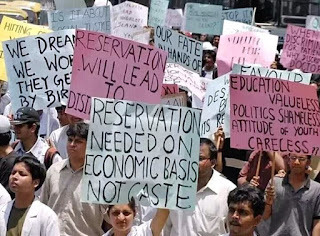 The decision is being viewed as a victory for tens of thousands of students and job-seekers who came out in protest against the reservation policy for special groups. This was one of the biggest protests that Bangladesh witnessed during Ms Hasina's decade-old rule and such united mass protests is rarely seen on such a scale in the country. According to the Bangladesh government's existing quota system, 56 per cent of jobs in the public sector are reserved for children of freedom fighters, women, ethnic minorities, people with disabilities and citizens of some backward districts. The protesters have been demanding the quota to be reduced to 10 per cent. There was a Caste System which existed in Hindu religion since 1500 BC to 1952 AD when it was abolished in the Indian constitution. In this caste system the people were divided into the four categories i.e. Brahmana, Kashtriya, Vysya, Shudra, where the Brahmana were the supreme one and the shudras were the discriminated ones. Karna during Mahabharat, did not get opportunity because of his low caste and now a days some caste do not get opportunity because of their “the so called” high caste. The post independence (1947) period comes with the great relief for the lower caste where the caste system was abolished under the Constitution of India and untouchability is declared as the crime under the law.India have the Domicile reservation of (50 – 85%) based on the domicile status of the people in various states and Union Territory of India. Reservation: Some get angry and some get relieved on hearing this word. We are children of One God like everyone else, We are the citizens of this country and our civilization is one of the oldest, our blood is red and its the same with all other indians. then why should they treated unequally ? The problem comes when the uplifted people of the reserved category claims its benefits. This makes it the problem of rich and poor. The downtrodden part of the reserved categories never get the benefits which they deserve. Its not a war between caste but between rich and poor. How can we remove reservation from India ? The best way to solve this problem could be: Make reservation on economic basis. A family should not be allow to avail the benefits of reservation if its above poverty line(at least in education) because there is a huge population who actually needs it. Yes,Reservations should be abolished completely... or it is on economic basis. Gov. will not do it.